This was inspired by saddle shoes and I think this is the two-tone shoe that Raissa referred to in my J Crew brogues post! The Vans ad showed a girl wearing this with a summer dress but it's so versatile that it will go with just about anything! Made with all leather uppers, it has the signature Vans checkerboard as lining. 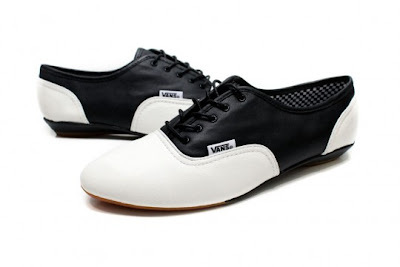 It's a real feminine saddle shoe with that slim wedge heel. I was actually pleasantly surprised that Vans would have something "delicate". But as with all Vans shoes, this is a practical buy because it has slip-proof micro-waffle rubber outsoles. It retails for $55. Hmmm, how about a modern take on a poodle skirt? This looks really cute! :) Are you planning to buy a pair of these soon? I'm tempted moxy, but it looks too similar to my Rag&Bones! Heehee, yes Raissa, meet Sophie! Hahaha! Let me know if you get these! Awwww, but yes, these are really great casual brogues Jmp! Awwww, I hope so Bobby! I'll let you know if I come across something for the boys! Yes, sure will. My friend also saw the same thing and is thinking of getting it too. Nice I've been looking for the same thing, and got here through Google.Did you know vans trainers uk summer collection ? I never seen your shoes before. Its a excellent. I also have some thing for you, its a lovely and fashionable shoes. Please check it, you must love it. Your shoes are elegant. I was looking for very long time. Now I've another site of pretty shoes. Its also lovely and comfortable.